Data from Chandra and Spitzer have been combined to search for some of the Milky Way's heaviest stars. Dust and gas obscure much of the view from optical telescopes from the plane of our Galaxy. 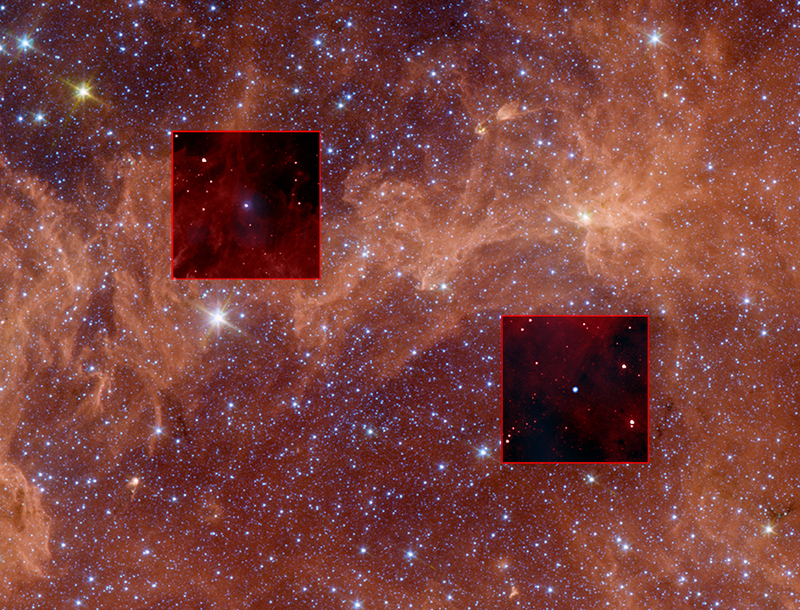 X-rays can penetrate this veil and help astronomers study these giant stars. Like looking for Easter eggs in a lawn of long grass, the hunt for the Milky Way's most massive stars takes persistence and sharp eyes. In their stellar search through our Galactic backyard, astronomers have used powerful telescopes sensitive to X-ray and infrared radiation to find evidence for a substantial population of X-ray emitting massive stars. This image shows infrared data from NASA's Spitzer Space Telescope near the plane of the Milky Way galaxy. Both outlined boxes contain an artificially darkened view of the Spitzer data, to highlight a bright X-ray source (blue) detected at the center of each square with NASA's Chandra X-ray Observatory. Each X-ray source coincides with a strong infrared signal. Analysis of the X-ray and infrared data, as well as optical and radio observations, reveals that these bright sources are, in fact, extremely massive stars. Two other massive stars have also been found near the plane of the Milky Way using similar methods. Deep observations from ESA's XMM-Newton also provided valuable information for these other two objects. All four of these stars are thought to be at least 25 times more massive than the Sun and lie between 7,500 and 18,000 light years from Earth. These stars are expected to last only a few million years and will end their lives with supernova explosions. Finding these very massive stars is not easy. Dust and gas throughout the Milky Way obscures much of the view from optical telescopes near the plane of the galaxy. Infrared images suffer less obscuration but are extremely crowded with stars. However, these stellar behemoths shine brightly in X-ray light and easily stand out from their neighbors in Chandra images. Why are these massive stars so bright in X-rays? Some massive stars have winds that blow material away from their surface at over 2 million miles per hour. If this high-speed material collides with the wind from a companion star, it is decelerated so suddenly that it acts like it has collided with a Solar System-sized brick wall. The shock waves resulting from this enormous collision generate temperatures up to 100 million degrees, and produce copious amounts of X-rays. These Chandra observations followed a survey of the plane of our Galaxy by the Advanced Satellite for Cosmology and Astrophysics (ASCA), a previous X-ray mission. This survey detected about 160 X-ray sources, but only a third of them could be definitively identified due to the limited spatial resolution of ASCA. Because Chandra's ability to resolve sources is significantly greater, much more precise positions could be obtained. This has allowed scientists to identify counterparts to the X-ray sources in other wavelengths. There are many other unidentified Galactic X-ray sources with X-ray properties similar to these four sources, so a large population of massive stars may remain to be discovered with future Chandra observations. These results were published in the February 1st issue of The Astrophysical Journal in a paper led by Gemma Anderson (University of Sydney). Other authors included Bryan Gaensler (University of Sydney), David Kaplan (University of Wisconsin, Milwaukee), Bettina Posselt, Patrick Slane and Stephen Murray (Harvard-Smithsonian Center for Astrophysics, or CfA), Jon Mauerhan (California Institute of Technology), Robert Benjamin (University of Wisconsin, Whitewater), Crystal Brogan (National Radio Astronomy Observatory), Deepto Chakrabarty (Massachusetts Institute of Technology), Jeremy Drake (CfA), Janet Drew (University of Hertfordshire), Jonathan Grindlay and Jaesub Hong (CfA), Joseph Lazio (Naval Research Laboratory), Julia Lee (CfA), Danny Steeghs (University of Warwick), and Marten van Kerkwijk (University of Toronto). Coordinates (J2000) RA 14h 45m 43.673s | Dec -59° 32´ 05.25"
Coordinates (J2000) RA 14h 46m 53.583s | Dec -59° 19´ 38.31"
I need photos of milky way.. Thanks for your question. These stars are too far away from the Earth for life to be affected, but they might put on an impressive light show depending on their distance and the level of absorption in the intervening gas. How is the "weight" mass of a star found? and what is the most massive star ever found so far? When one of these super massive stars goes super nova at the end of it's life would the earth be affected in anyway from the explosion. This is lovely and amazing. Excellent. Very nice pictures and many details. Send us more. Thank you very much to the team of Chandra and Spitzer. Chandra observatory Hunting for the Milky Way's Heaviest Stars is mark of big success, it gives definitely a way of right Goal. Thanks. Regards to all of you. Excellent photos of the Milky Way's Stars of heavy deep of space. Congratulations. Very excellent photos and comments. Congratulations to my goddaughter, G. A., on leading such an eminent team and expanding our knowledge. Very massive stars near the plane of the Milky Way galaxy. About 9,000 light years from Earth. X-rays from Chandra and infrared data from NASA's Spitzer Space Telescope. Wide Field 86 light years across, Inset 16 light years. Inset images: X-rays are blue and the infrared data are red. J144547-5931 in the constellation Centaurus visible in the Southern Hemisphere and J144701-5919 in the constellation Circinus visible in the Southern Hemisphere.